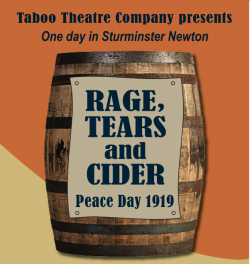 THE Sturminster Newton-based Taboo Theatre will be performing Rage, Tears and Cider to mark Peace Day on Sat­ur­day 10th Nov­em­ber at The Exchange. This new play by Tony Benge and Sue Ashby was commissioned by Taboo. It is set on a single day in 1919 in Sturminster Newton, and uses real characters and facts from that time in an original and fictional script. Performed, twice, on 10th November, it marks the centenary of the Armistice. 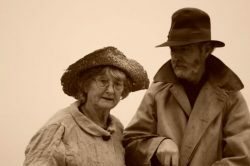 This living snapshot of the people of Sturminster Newton after the War will be performed will be in the Stour Hall, in the round, with the audience surrounding the action. The Taboo actors are all local, some the descendants of families who were in North Dorset in 1919. Taboo came into being in 2006 in association with the Martinsey Isle Trust. Their production of Colder Than Here by Laura Wade toured the UK for five years to great acclaim. Rage, Tears and Cider is Taboo Theatre Company’s third production. Posted in Prompt on 28 October, 2018 .